Exceptional patient care is our standard. To provide the best possible results for every patient, we employ the latest in dental technology. At our Windsor, CA, practice, advanced imaging and laser techniques ensure you receive the most accurate diagnosis and effective treatment. Resembling an oversized pen, the intraoral camera provides the dentist and patient with a detailed view of the teeth, gums, and other soft tissues. This hand-held tool offers powerful magnification enhanced with built-in LED lighting and a swiveling 90-degree head. Intraoral cameras are used to detect decay, hairline cracks, gum disease, and oral cancer. The dentist can painlessly examine teeth and surrounding tissue in extreme detail on a chairside screen, helping to not only make an accurate diagnosis, but also helping the patient understand the state of their oral health. The Panorex provides a two-dimensional panoramic view of your mouth, including areas of the jaw that cannot be seen with traditional X-rays. Sometimes called a “full-mouth X-ray,” the resulting image can be used to detect cysts and tumors, and diagnose gum recession, TMJ disorder, and other issues. Our office uses this technology when preparing for restorations (dental bridges, crowns, and dentures), orthodontia, periodontal treatment, and surgery. Cone beam imaging provides an incredibly accurate assessment of the health of your jaw, helping us plan dental implant placement and other treatments. Cone beam computed tomography (CBCT) allows our dentists to produce 3-D images of teeth, tissue, bone, and nerve pathways in a single scan. This is similar to conventional CT (cat scan) imaging, but emits about one-tenth of the radiation. 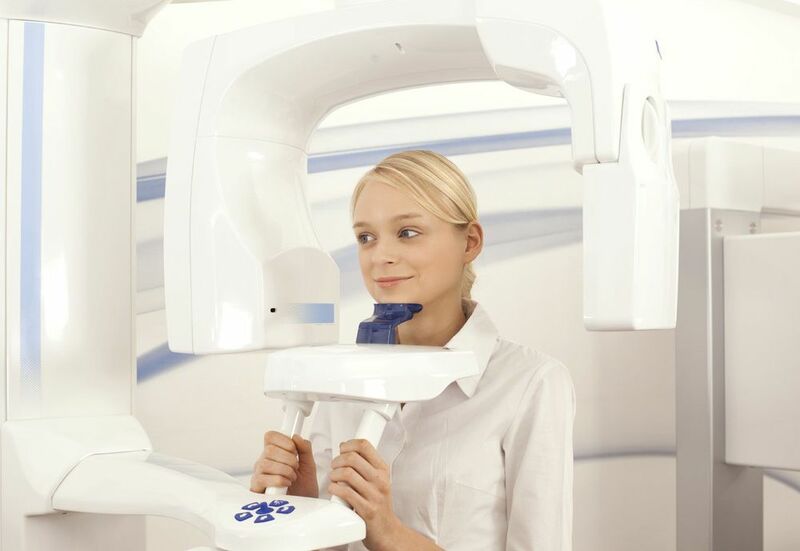 Rotating around the patient’s head, the scanner provides almost 600 distinct images, providing the best possible visual for any type of dental diagnostics. The advanced tools at our disposal allow us to provide treatment with the utmost safety, precision, and efficiency. CBCT is an unsurpassed method for planning orthodontia and complex dental surgery. We use the technology most often for dental implants patients, to assess jaw bone density and determine the best placement strategy. We use precise laser technology in a variety of ways, including cosmetic procedures such as teeth whitening and gum reshaping. Lasers are also very effective treatment for gum disease. Lasers minimize pain, bleeding, and swelling, and promote rapid healing. At Windsor Dental Group, we take pride in providing extraordinary care for each and every patient. Dr. Andriy Shevchuk and Dr. Lev Korovin are both meticulous, highly skilled professionals dedicated to your oral health. Under our care, you can expect that sophisticated technology and years of experience are the foundations of your diagnosis and treatment. Providing beautiful, healthy smiles is our passion, and the advanced tools at our disposal allow us to provide treatment in the utmost safety, with exceptional precision and efficiency. To schedule your consultation, please contact us today.